Place biscuits in a snap lock bag and seal. Using a glass, press biscuits until finely crushed. Place in a bowl and add melted butter, stir to combine. Using the glass, press mixture into the bottom of the prepared tin and along the sides. Refrigerate shell for at least 20 minutes. Meanwhile, beat Moondarra Cranberry Macadamia cream cheese with handheld mixers or with a whisk until softened and resembles a pourable batter. Add condensed milk, lemon juice and ½ of the dried cranberries and continue to beat until fluffy. Spoon mixture evenly into tin and refrigerate overnight. 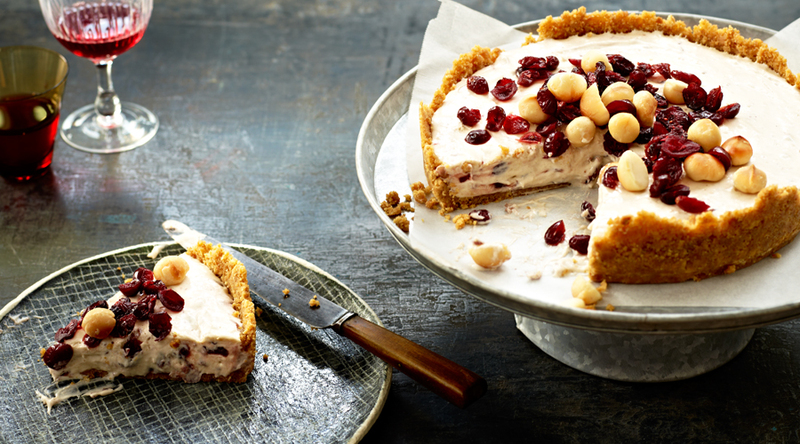 Serve scattered with roasted macadamia nuts and defrosted cranberries.